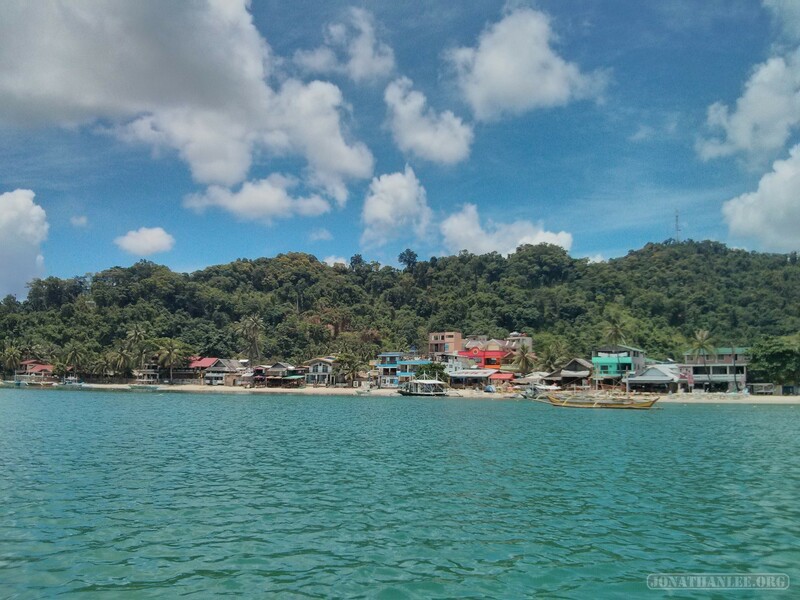 Taking the bus from Sabang to El Nideo is a long, long ride, something like 10 hours. 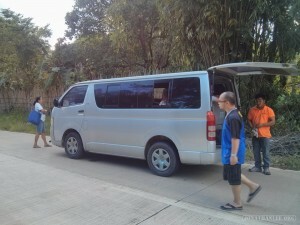 So I chose to go with a faster minibus – but of course, it breaks down mid-journey, so we’re left sitting around twiddling our thumbs for a couple of hours. 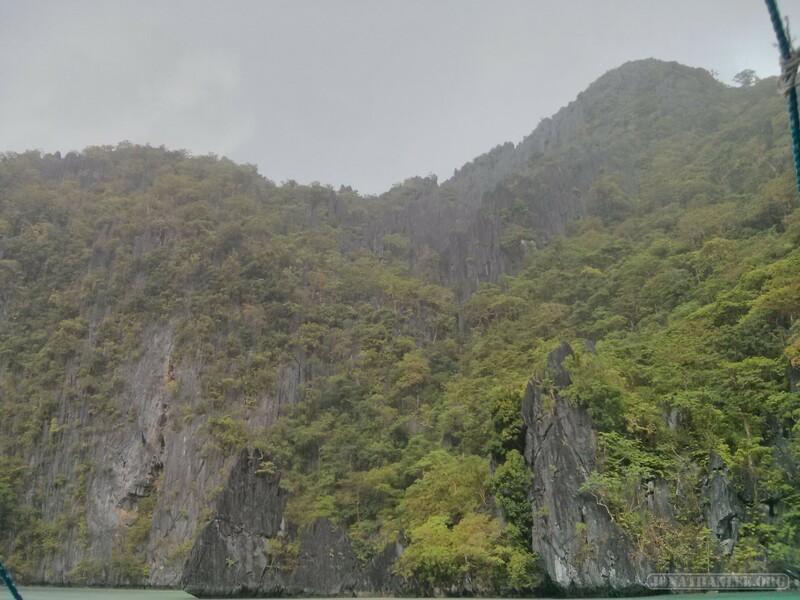 It’s a very long journey. 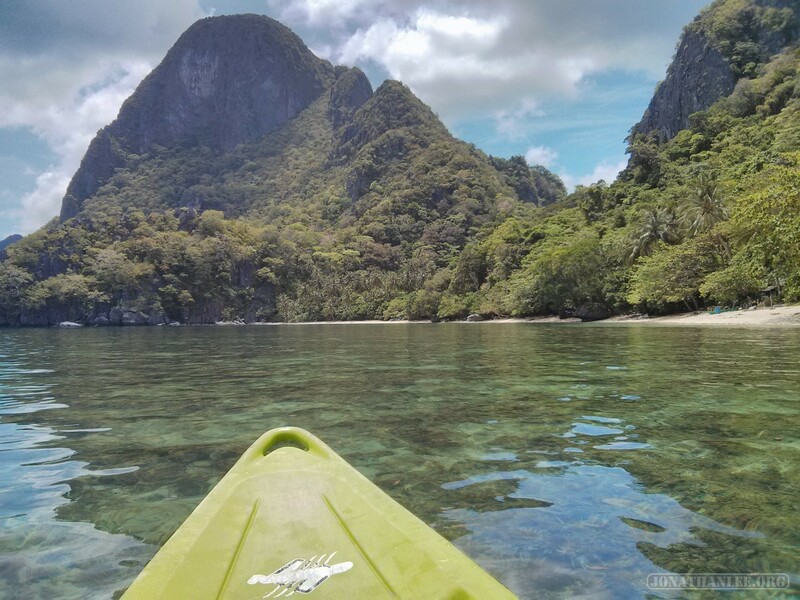 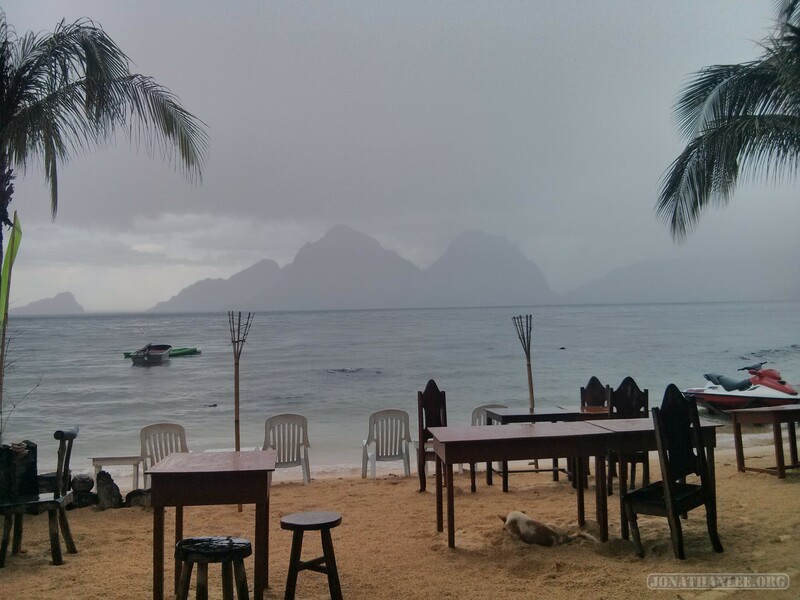 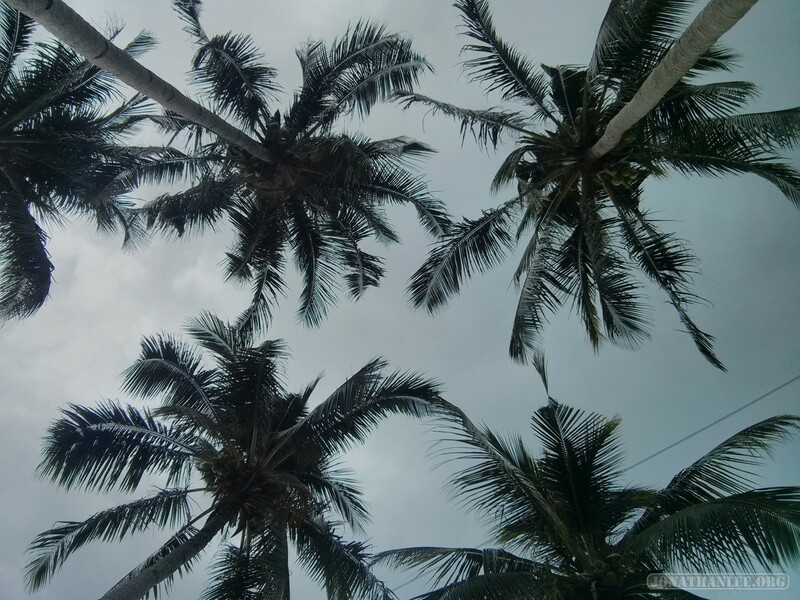 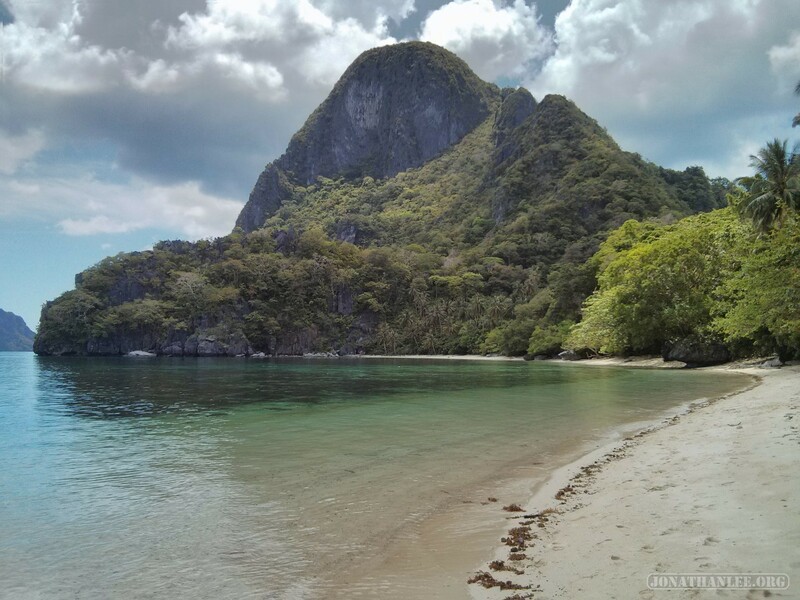 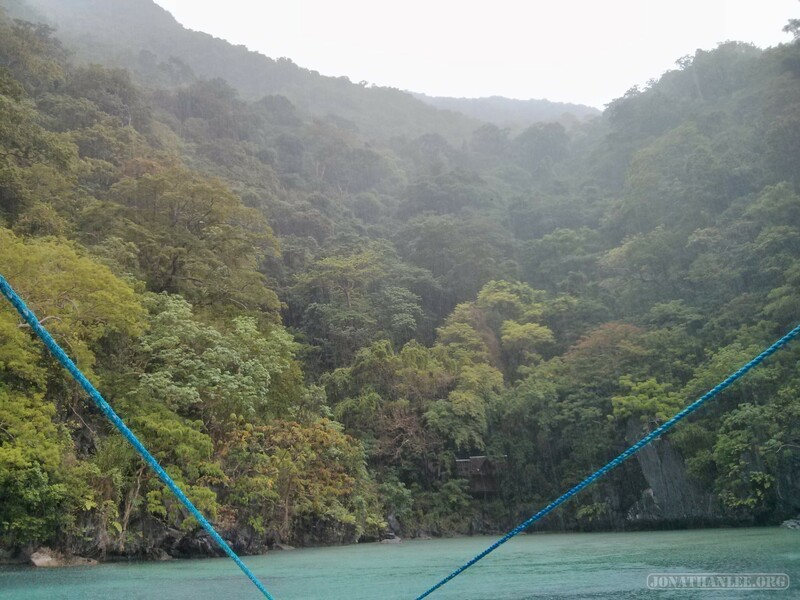 For a town that doesn’t have 24-hour electricity, El Nido has one strange problem – it’s too crowded! 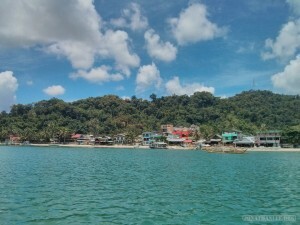 Surrounded on one side by hills, and on the other side by the ocean, there’s not a lot of room to expand and so the town is very densely packed. 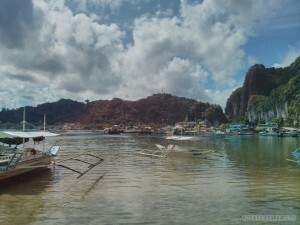 And as result, very little of the sea wind blows through town, and it’s extremely hot. 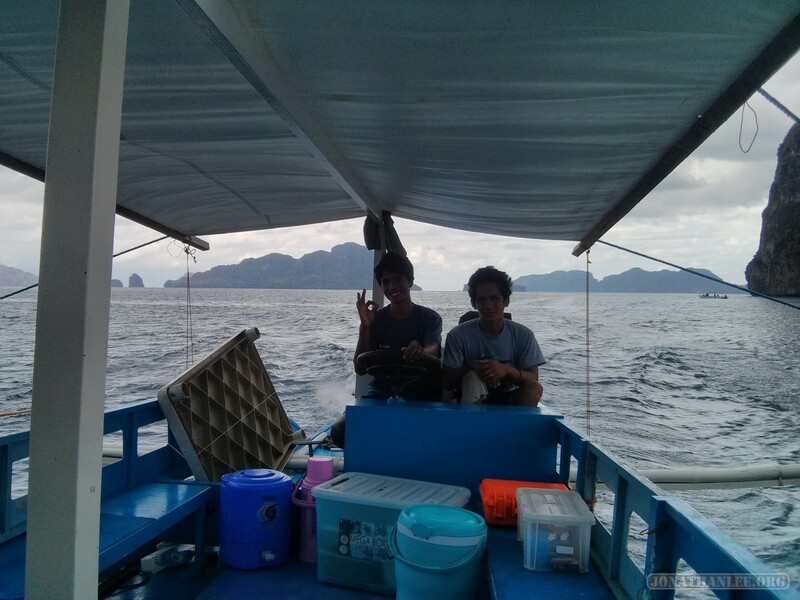 It’s all right in the afternoon, when there is power for AC and fans. 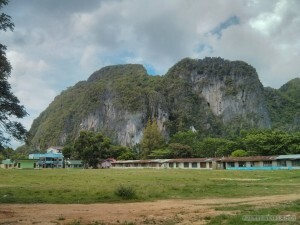 But waking up in the morning sweating after the fans have turned off from lack of electricity is disappointing. 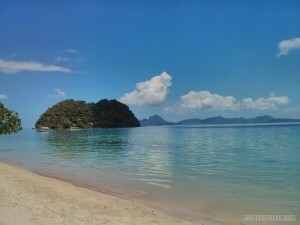 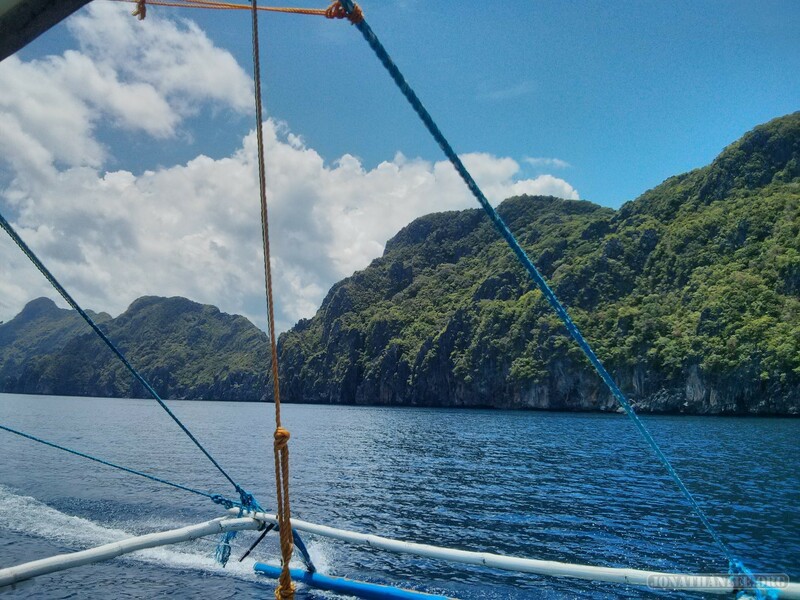 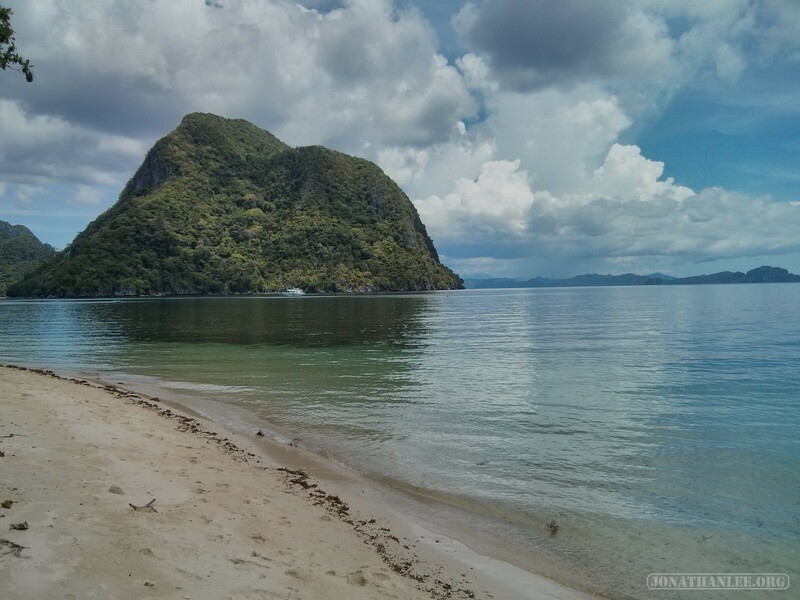 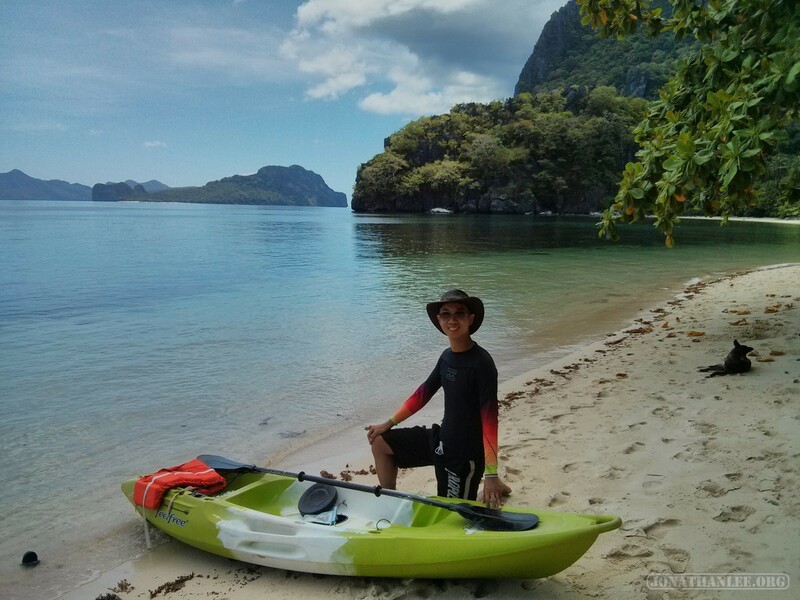 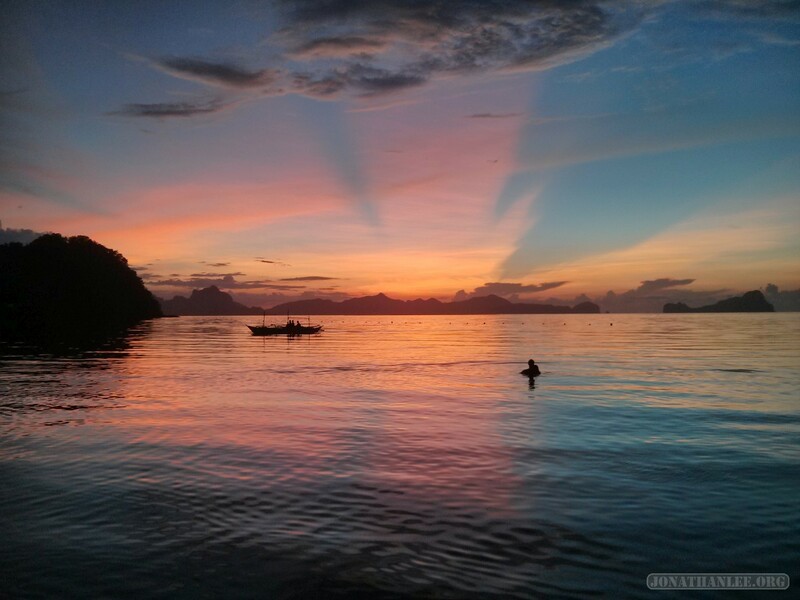 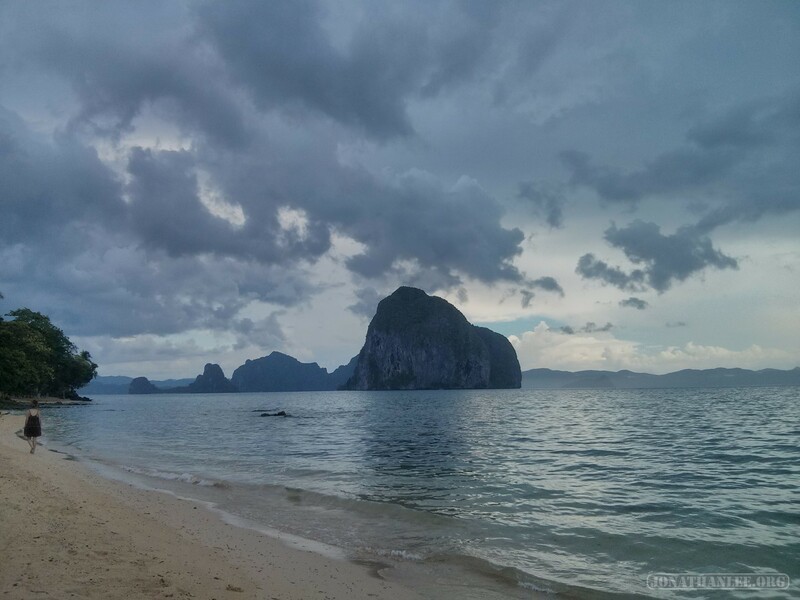 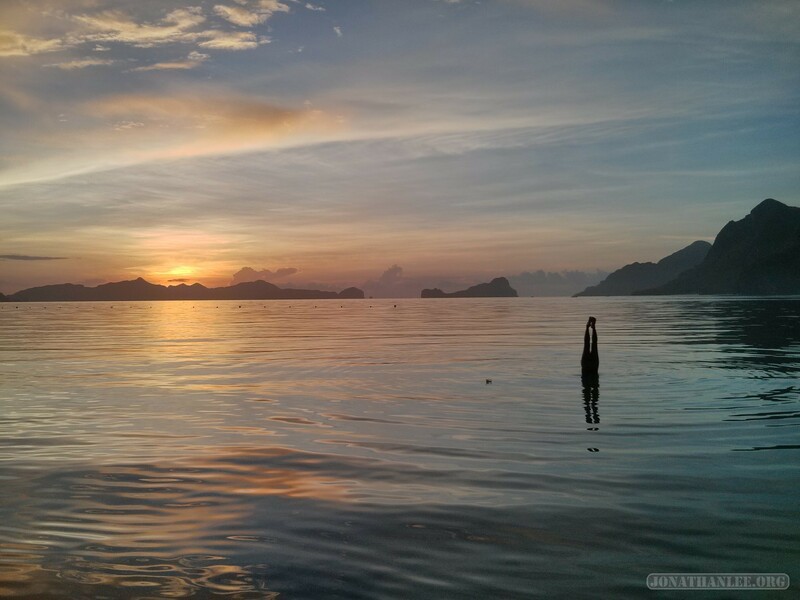 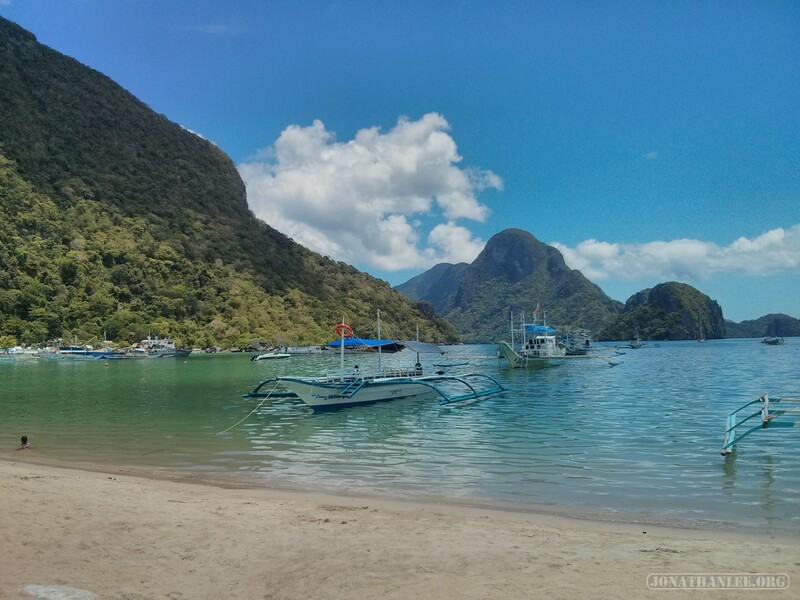 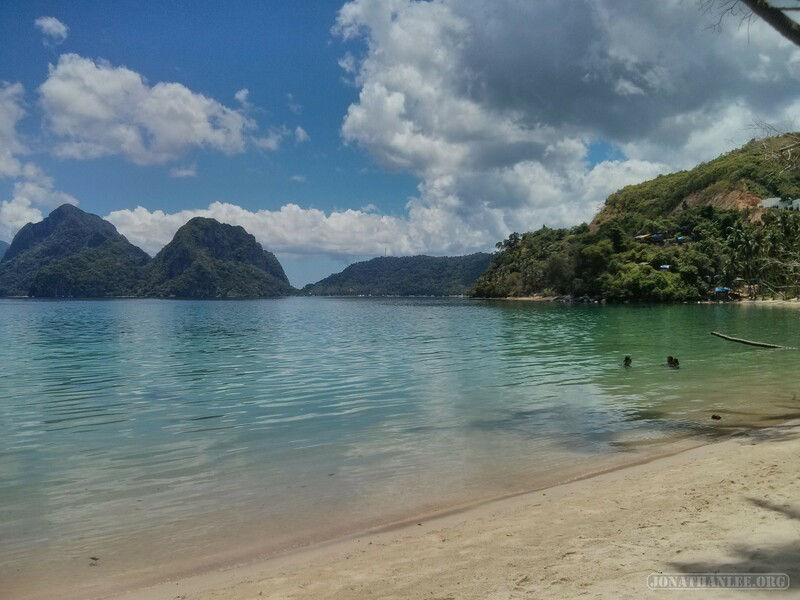 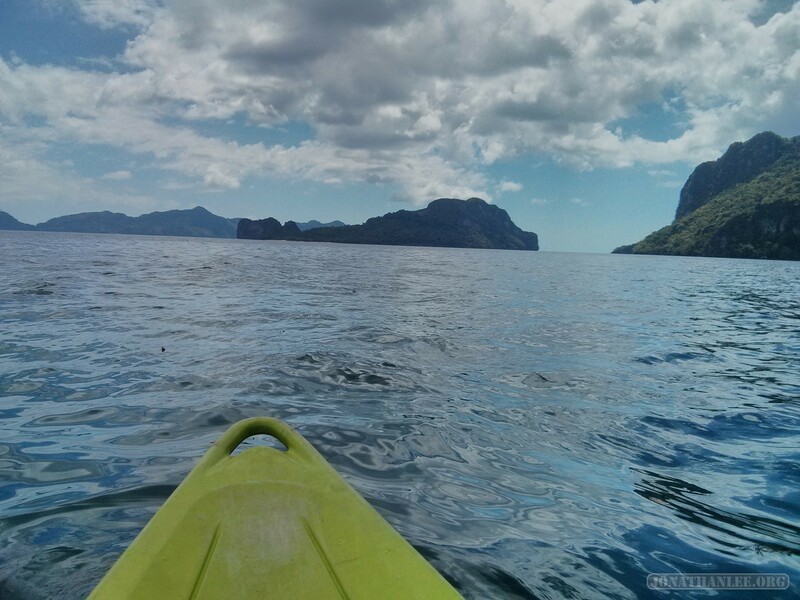 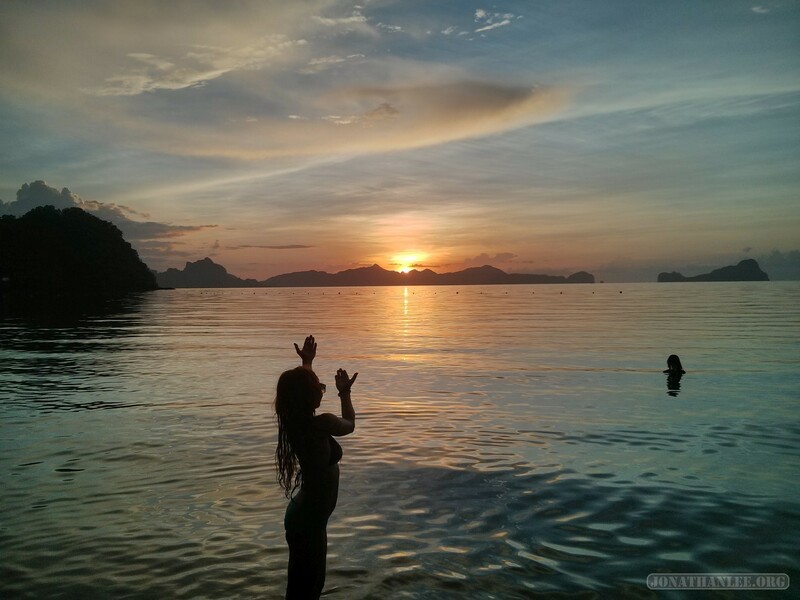 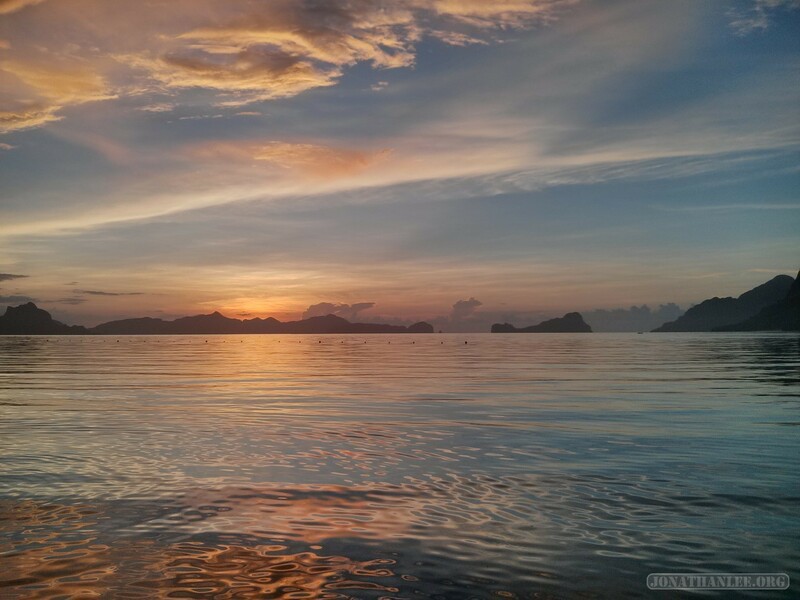 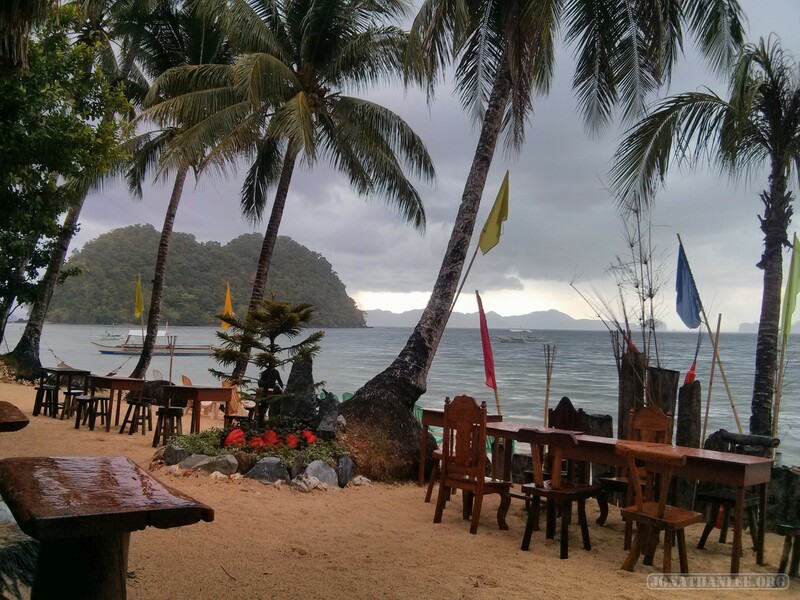 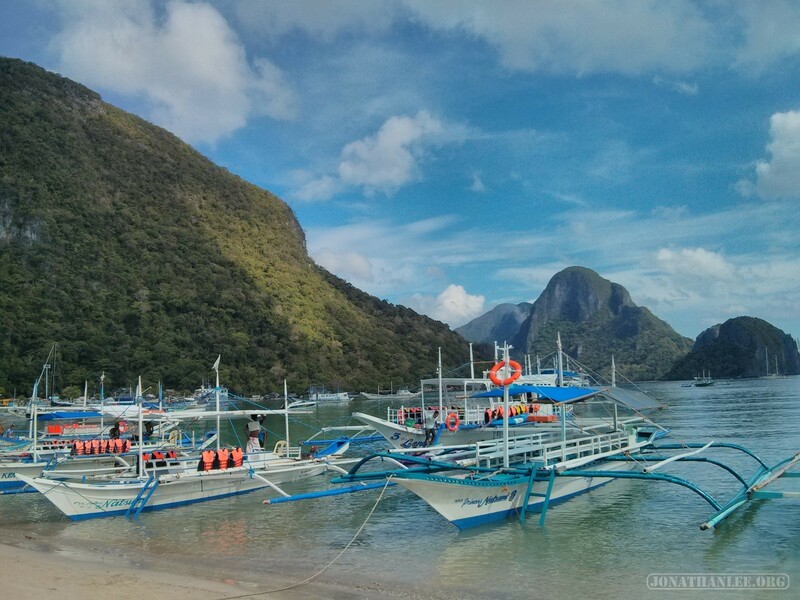 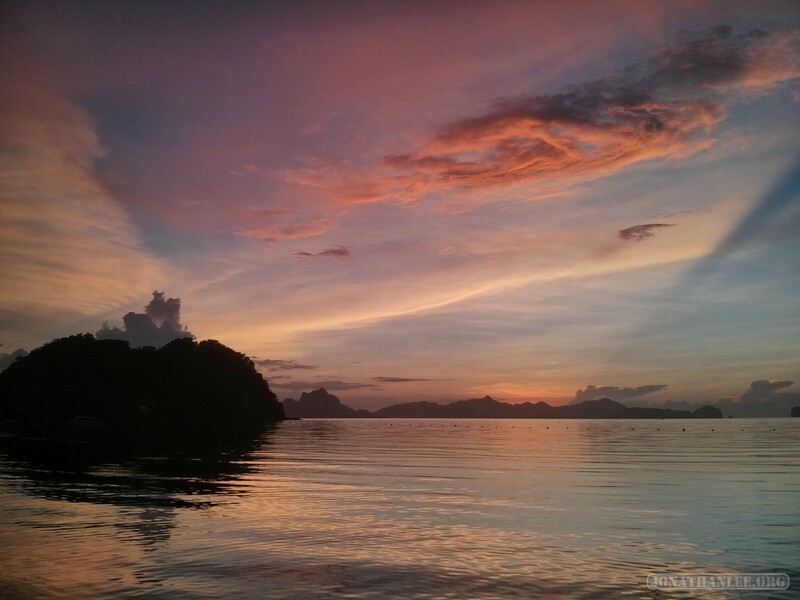 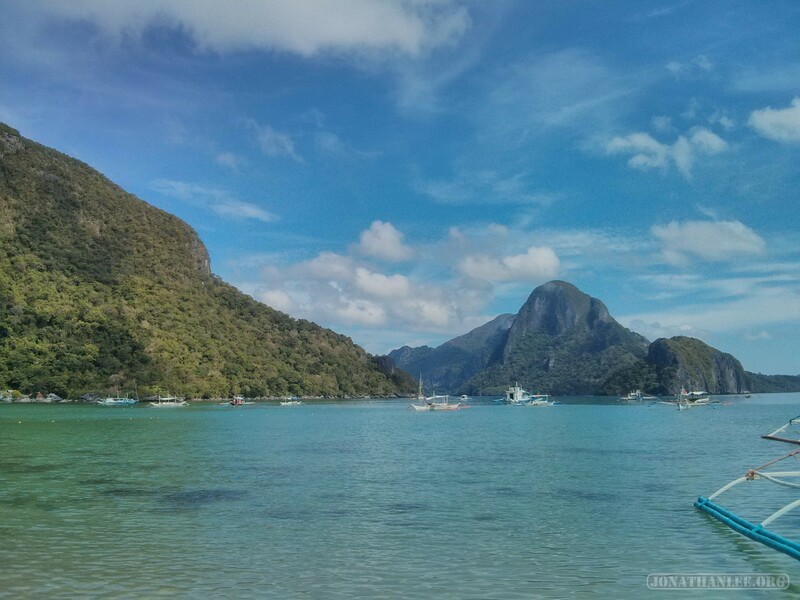 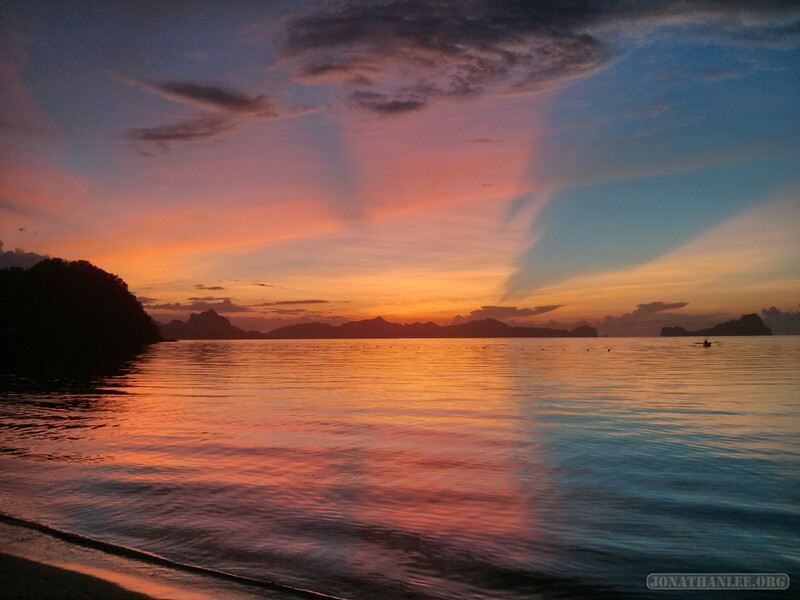 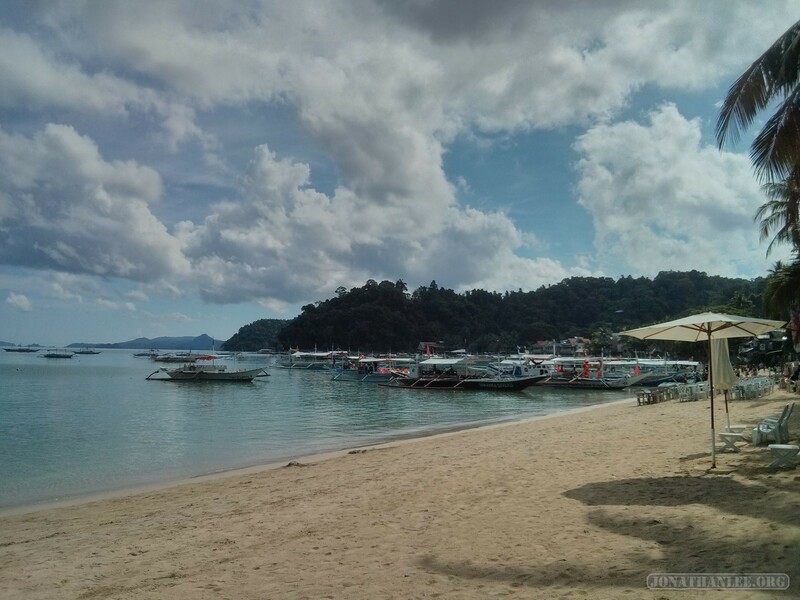 Since El Nido is built right by the beach, it’s got a pretty decent beach – but it’s also quite full of boats. 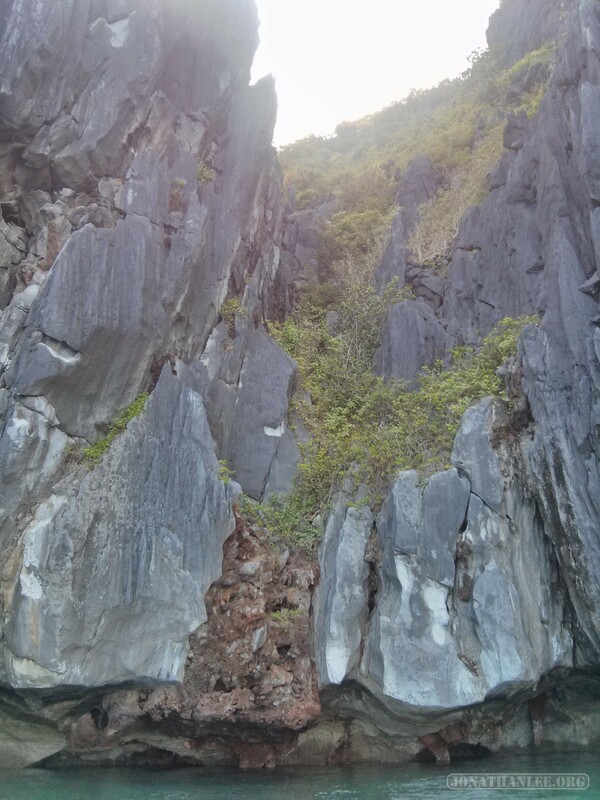 Behind the town are the cliffs where swifts live, where swift nests used to be harvested for El Nido Soup. 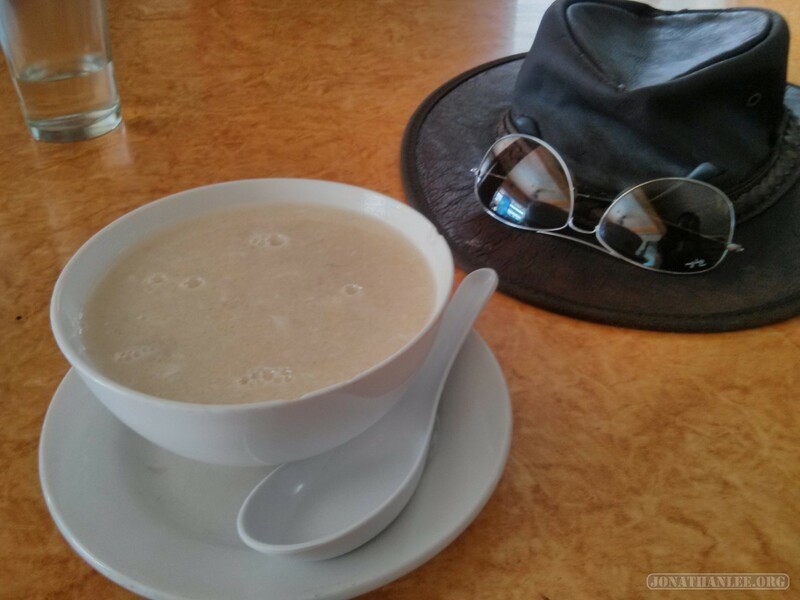 When I tried the soup later, I discovered it had an unremarkable earthy taste, rather like egg drop soup, bu with a more chewy texture, similar to bird’s nest soup. 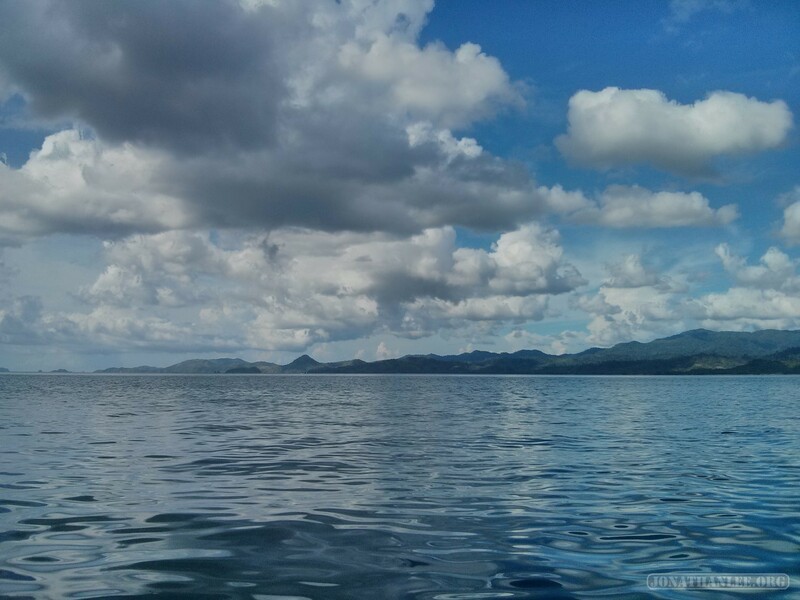 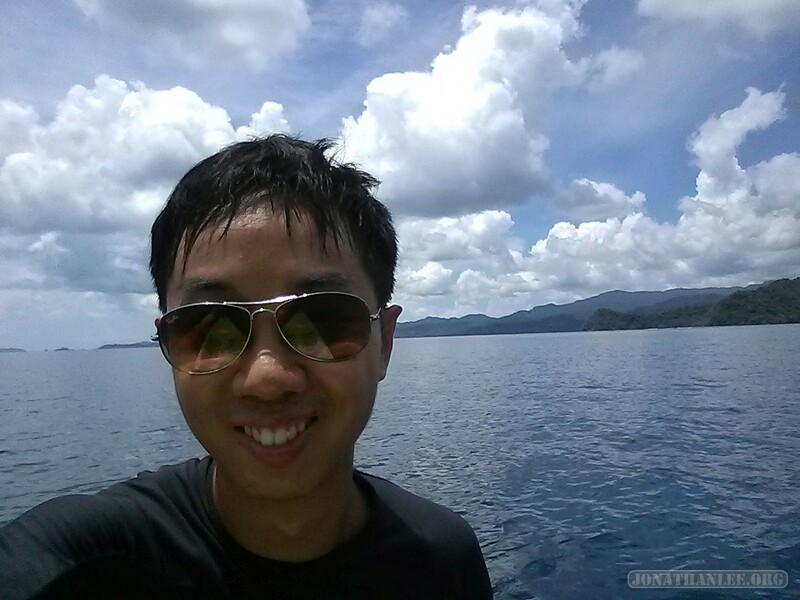 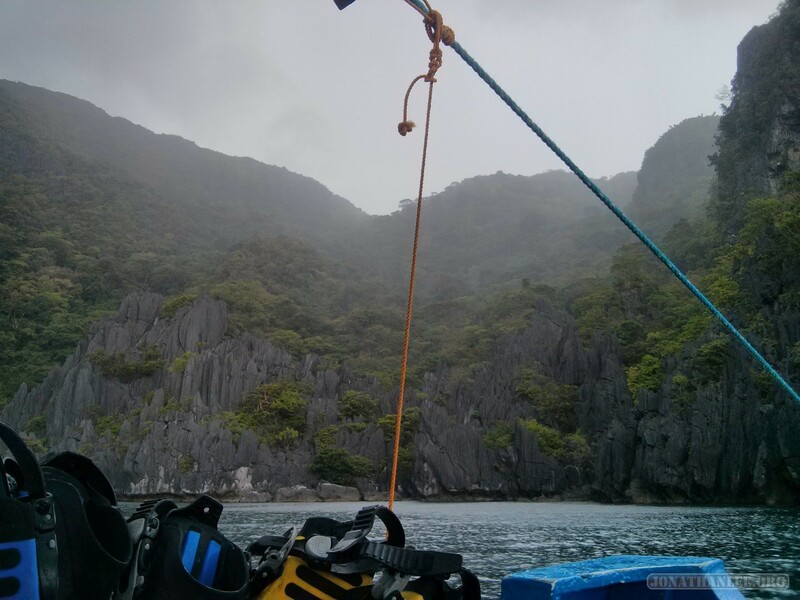 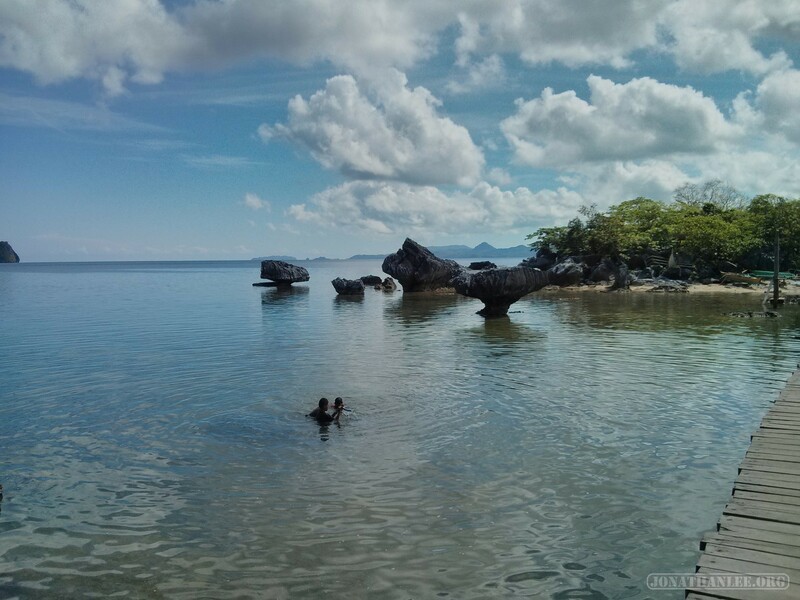 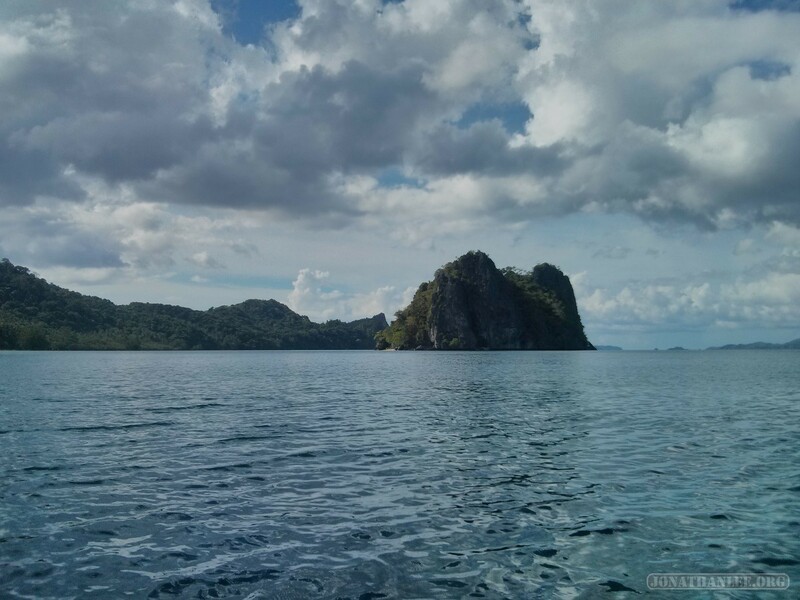 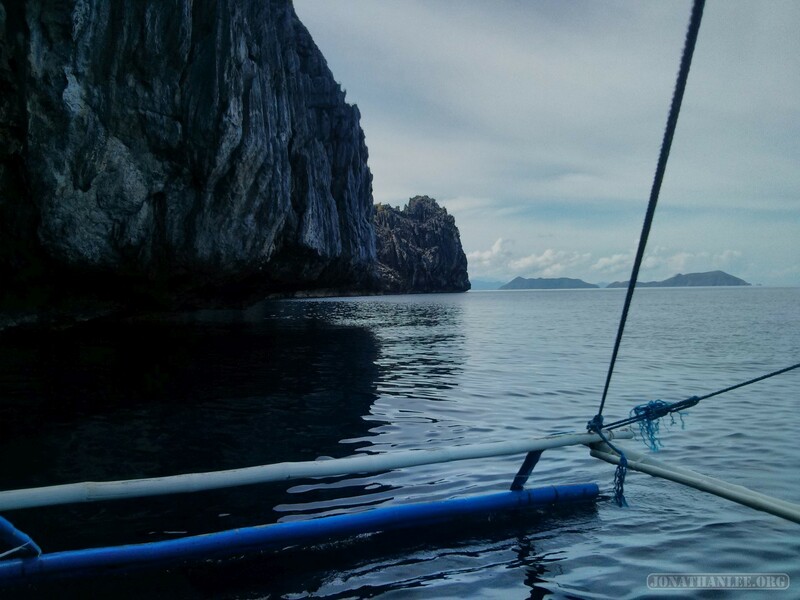 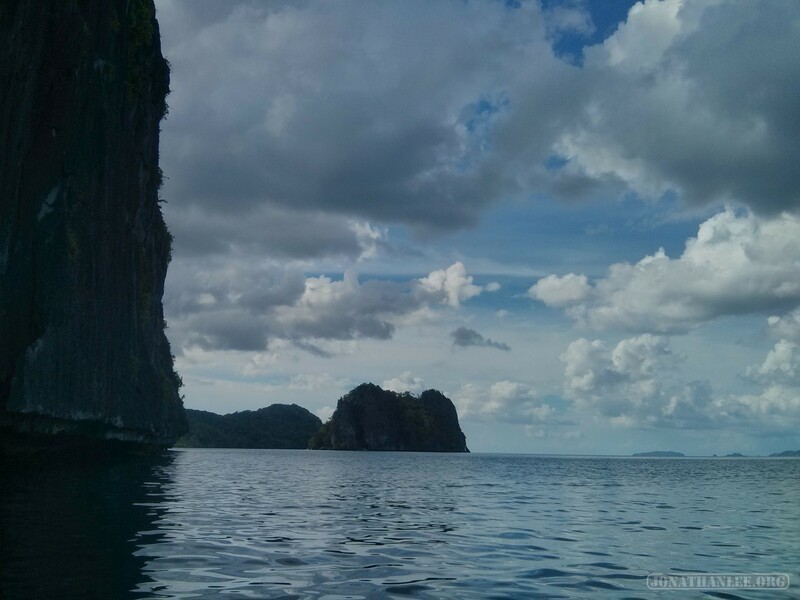 Scuba diving is what I came to El Nido to do, and scuba dive I did. 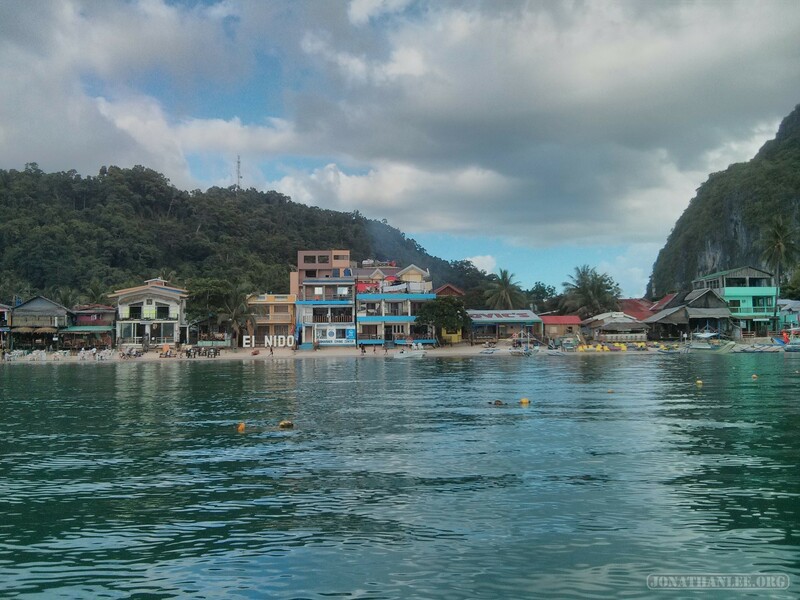 There’s a lot of dive shops in the town, but I went with a small boutique-like dive center, El Diver, and it was amazing. 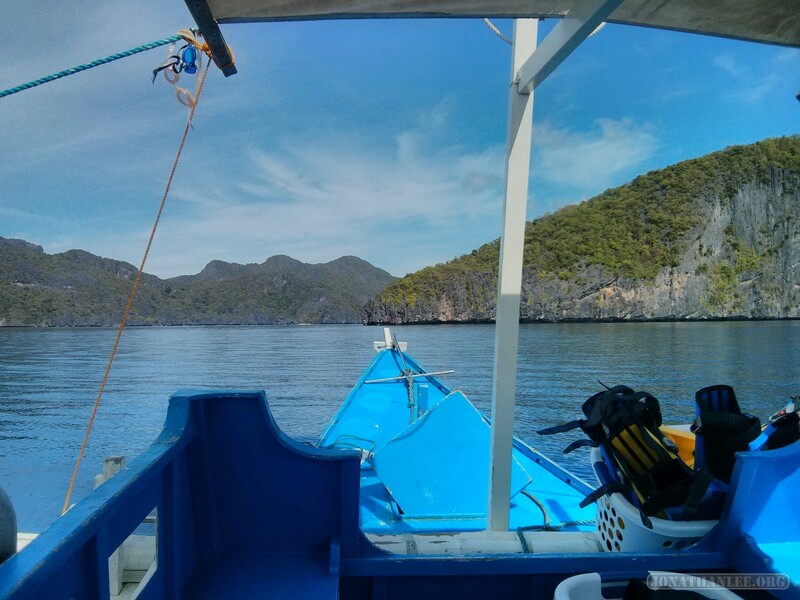 Combining a small group of divers (3 including me) with a great divemaster (and operations owner), we had some great long dives away from the usual crowd. 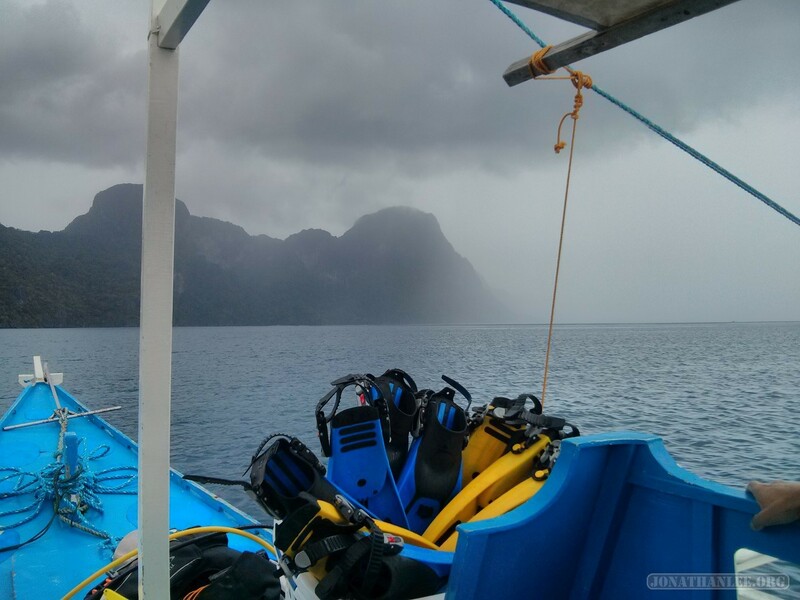 And for the last dive of the day, we went down during the rain, explored a set of tunnels, and came into the sunlight! 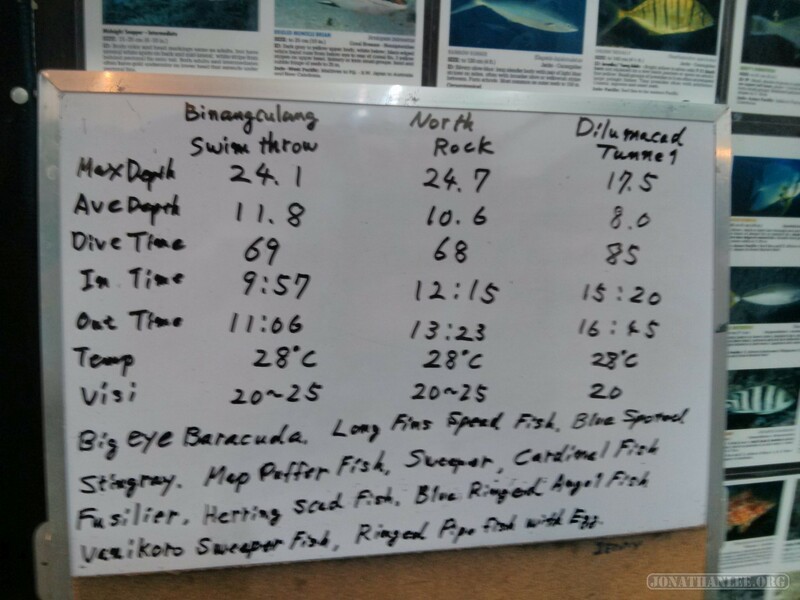 Check out my dive stats! 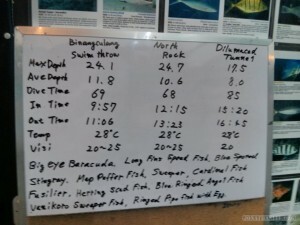 Hour-long dives every time! 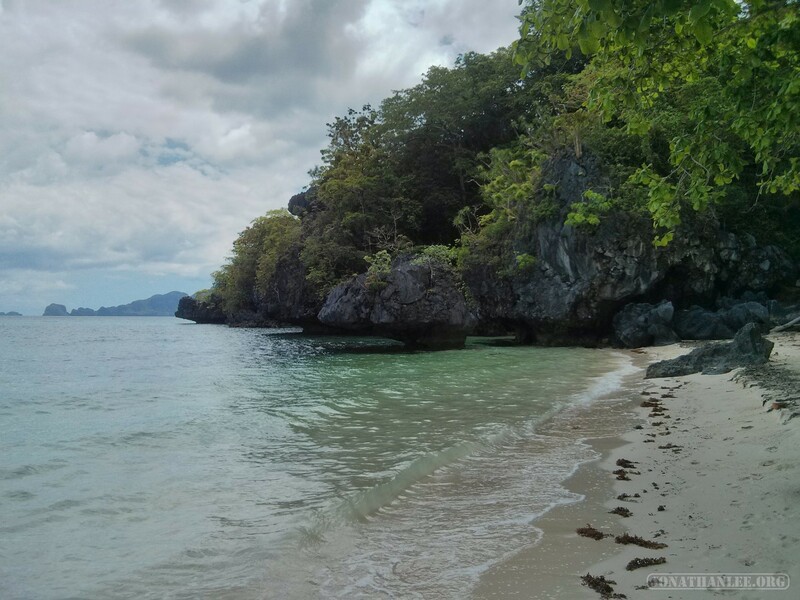 Las Cabanas are a set of nice beaches a bit away from the main town. Annoyingly, all the tuk-tuks are banding together into a cartel to set prices – you can slyly get to the beach for 50 pesos, but if you want to leave, the tuktuk mafia waiting at the exit charges 150 pesos. 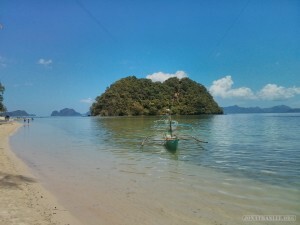 Still, it’s a very nice beach. 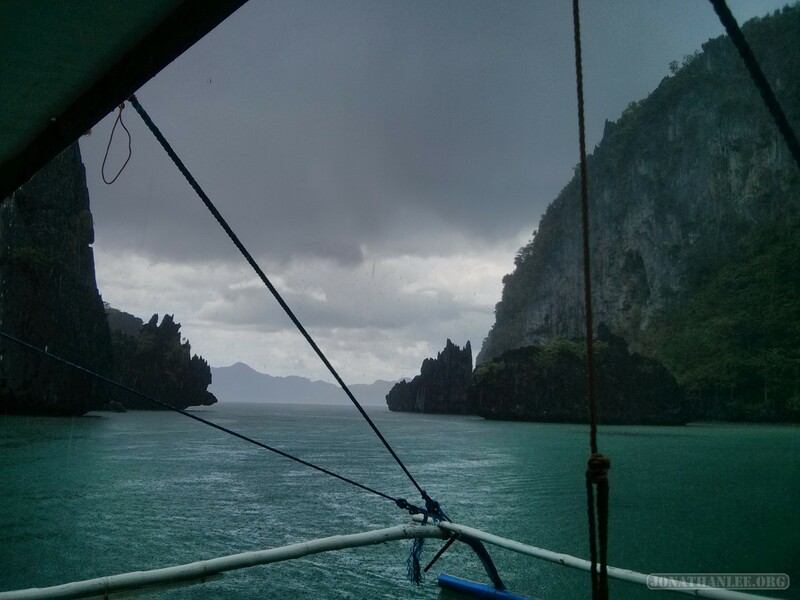 Here too, the daily storm made a visit. 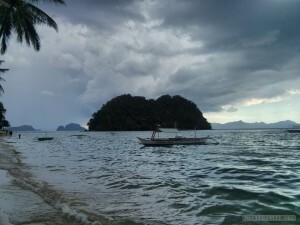 Over the course of half an hour, the sky darkened, threatening clouds loomed, and then the rain obscured the distance islands. 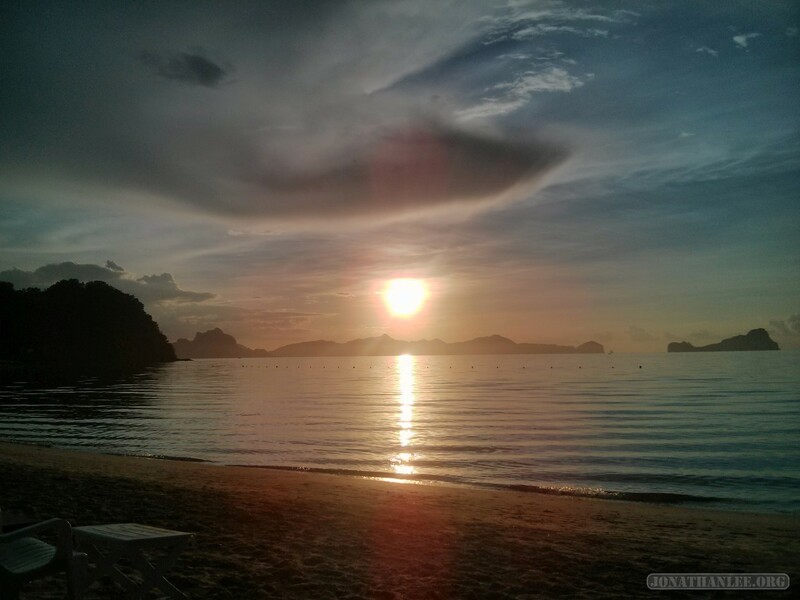 And the sunsets at Las Cabanas are especially beautiful. 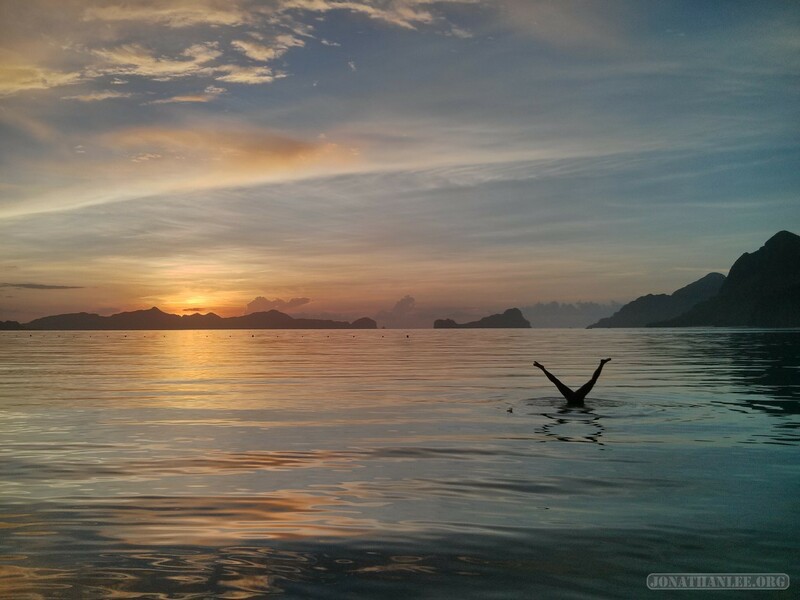 Some new friends also decided to pose in the sunset! 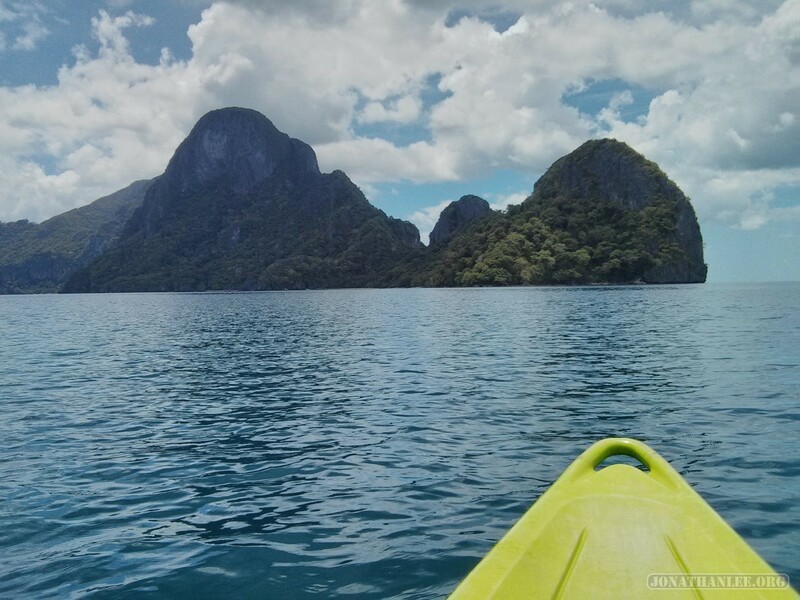 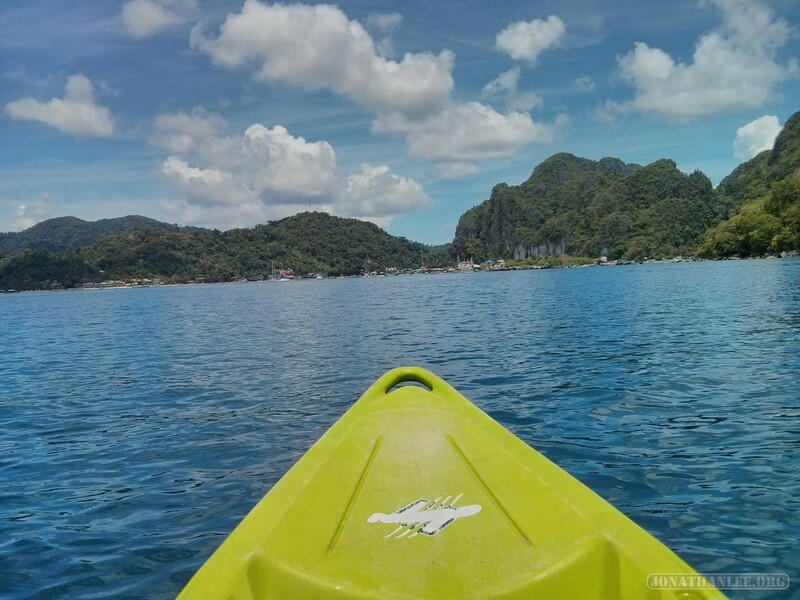 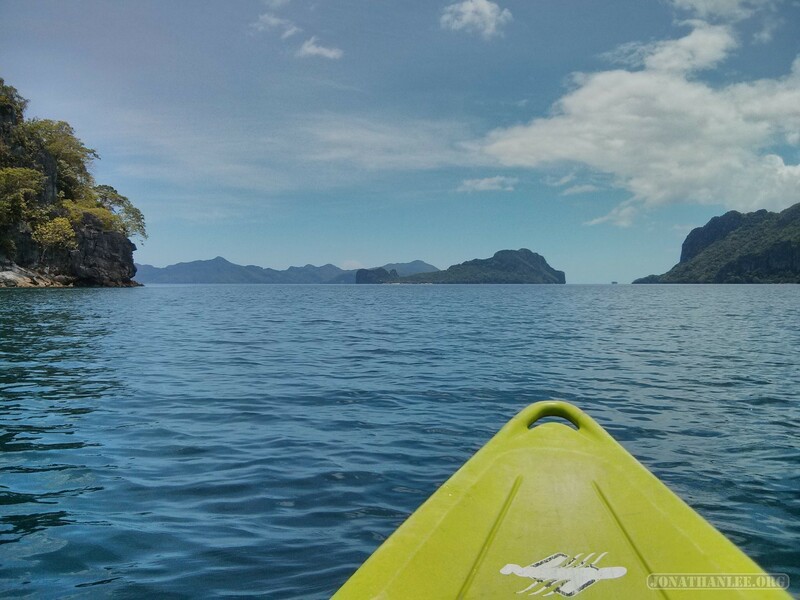 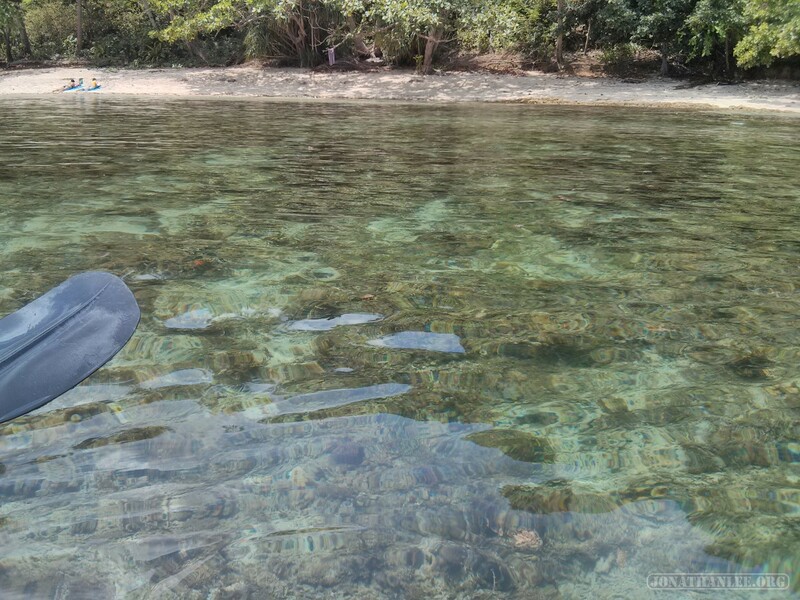 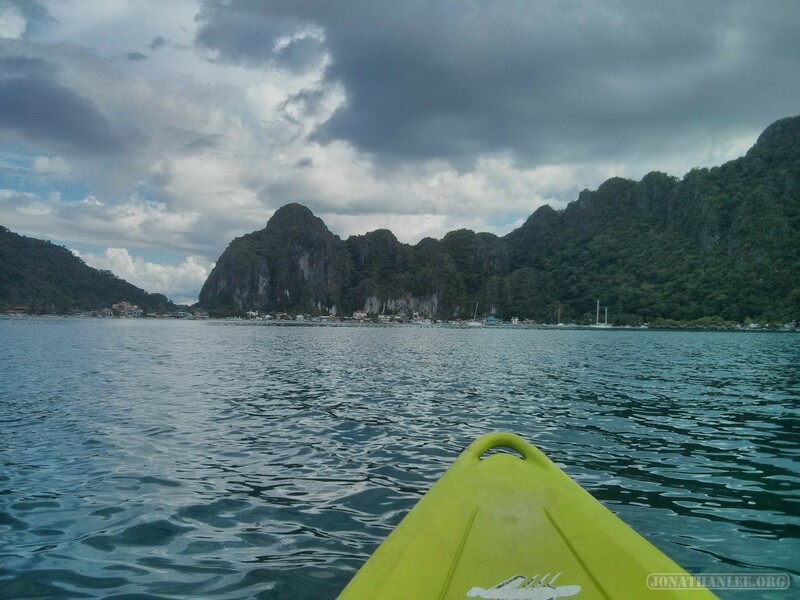 With some clear waters and great views, kayaking seemed fun, so I rented myself a single-person kayak, and went out to explore! 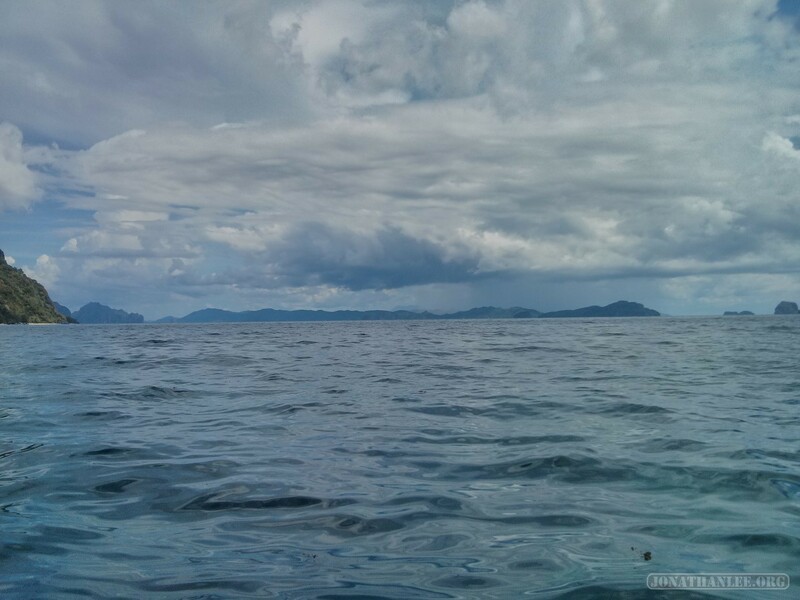 There weren’t many waves out there, even on the open ocean, so it was quite a tranquil experience, just chilling and relaxing on the ocean. 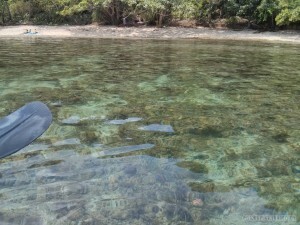 While on the kayak, I even lay down and took a mini-nap several times! Check out how clear the waters were! 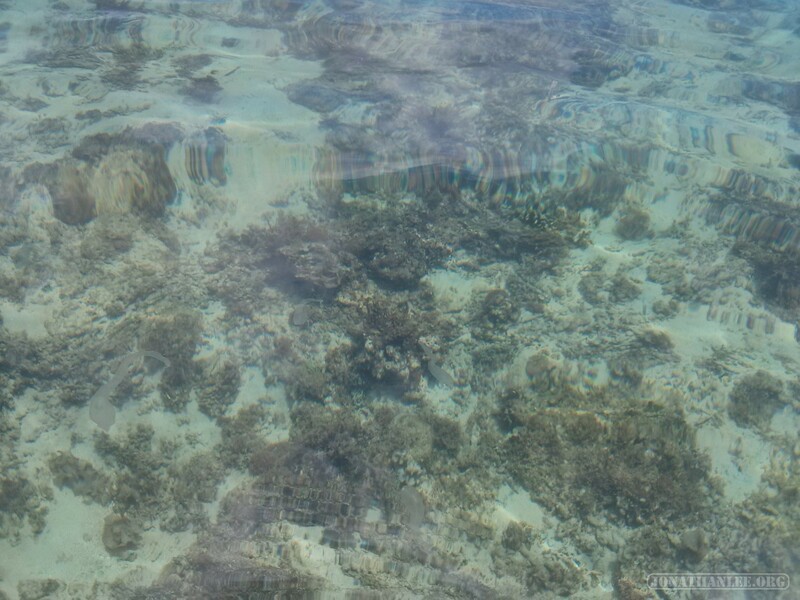 You could look down and see the coral underwater! 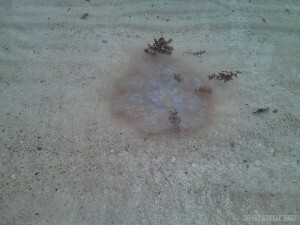 Unfortunately, there were also a lot of jellyfish around. At least the clear waters made them easily visible. 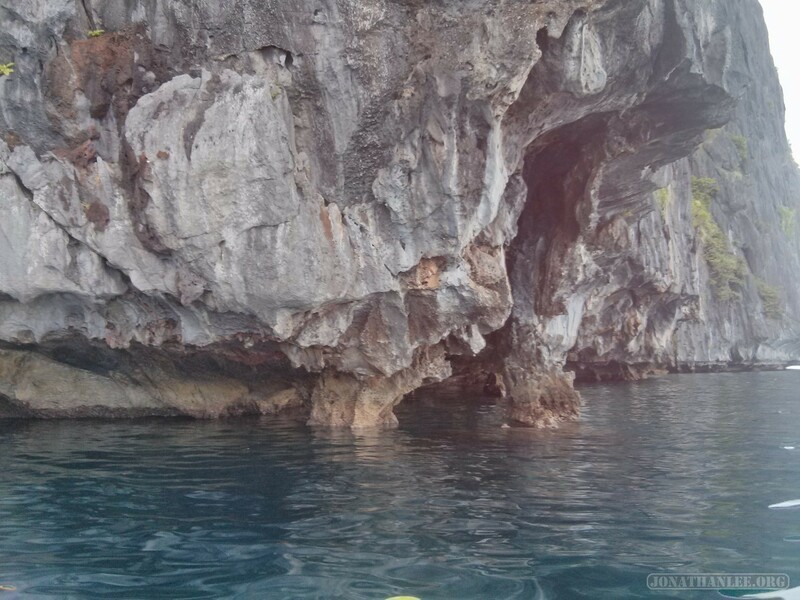 The cliffs, jutting straight out of the water, seemed liked a interesting feature to explore, but they’re actually somewhat unremarkable – you’re just paddling alongside a giant wall.